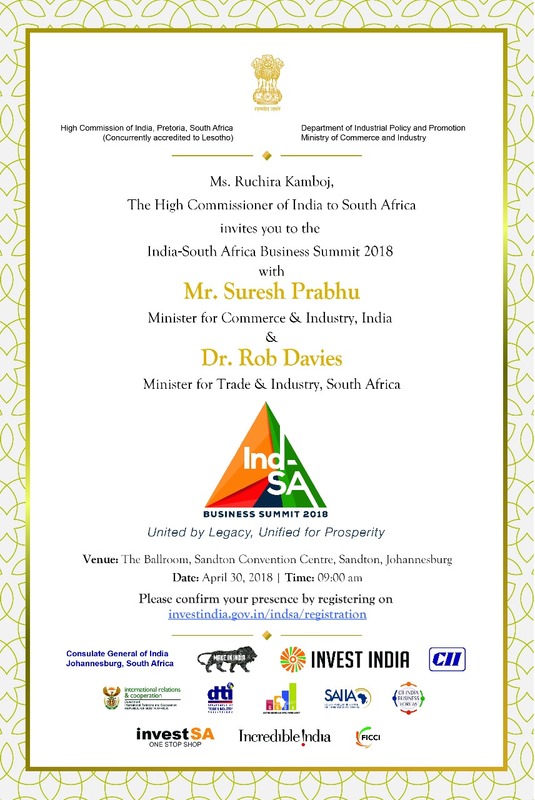 The Consulate General of India is happy to announce and inform you about the first ever India South Africa Business Summit (ISABS 2018) to be held on April 30, 2018 at the Sandton Convention Centre, Johannesburg. A one-page background briefer , invite and the Agenda is placed below. You are cordially invited to participate in this Summit, which will upgrade India-South Africa bilateral business relations as well as promote trade and improve people to people contacts. With the tag line “United By Legacy, Unified for Prosperity”, the Summit seeks to maximize the potential of the economic and commercial partnership between our two countries. We would like to inform that the Summit will be marked by the presence of Mr. Suresh Prabhu, Minister of Commerce and Industry, Government of India and Dr. Rob Davies, Minister of Trade and Industry, Government of South Africa. As well, the Premier of Gauteng Province, Mr. David Makhura has kindly consented to be present on this occasion together with captains of industry of both countries and prominent Indians and South Africans from all walks of life. All are invited for this Summit. You may also kindly forward this information to all your contacts and related associations so that they can also register FREELY and participate. You may kindly like to register at the link http://www.investindia.gov.in/indsa/registration Please note that the registration for the event is FREE. For any queries, please contact Consulate General of India in Johannesburg at isabs2018@gmail.com. We look forward to welcome you at the Summit and hope for a fruitful participation and interaction from your side at the event.